We in Dream Links provide professionally managed concierge Golf Links Tours to the North West of Ireland for the connoisseur golfer. There are approx 35,000 golf courses in the World but only 246 are true links courses. Six of these form a wonderful cluster of Links Golf along a wonderful stretch of the Wild Atlantic Way Coastline in the North West of Ireland. They are located on stunning stretches of coastline, nestled amongst magificent sand dunes and with fairways of fine textured, tight turf for which links courses famed. Our mission in Dream Links is to help you discover the joy of Links golf in this part of the world and to enjoy the unique links experience during your time. We plan your trip of golf and can provide a challenge match against local members. Included in the plan are non golfing activities such as Catch and Cook boat trip around Sligo Bay. We schedule it to meet your requirements and we schedule each element of the trip. We operate a luxury concierge service from the minute you land untill you leave. Voted the Best Links in Ireland by IGTOA in Nov 2016, the County Sligo Golf Club is widely regarded as one of the great championship links courses. It is located in the picturesque seaside village of Rosses Point, known locally as “The Point”. The club is home to the famous West of Ireland Open amateur championship played every Easter since 1923 and has hosted the Home Internationals, the Irish Close and the Irish Professional Matchplay Championship. Phase 1 of a significant upgrade to the course was completed in 2017 overseen by the Master of Links Design, Pat Ruddy. 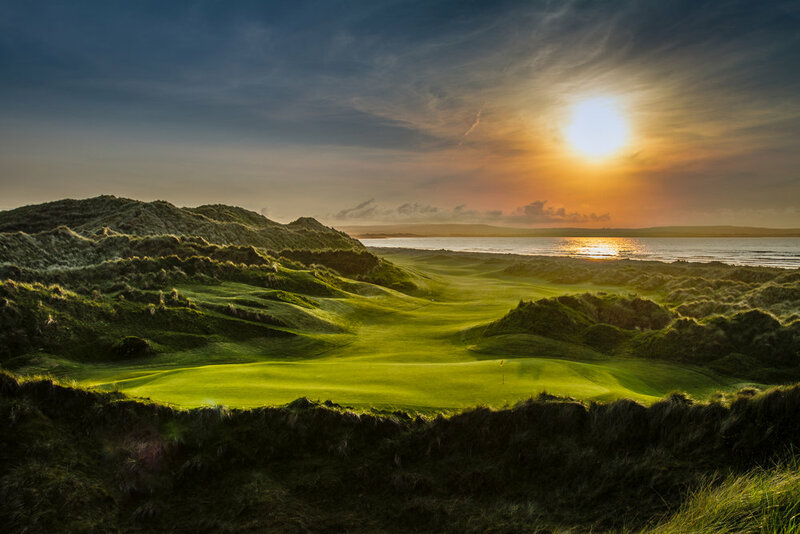 Enniscrone Golf Club Is considered one of Ireland's finest authentic links golf courses, The courses stretches out over 7,000 yards and demands solid driving. Enniscrone boasts scenic vistas of Bartra Island, Killala Bay and sandy beaches, with Nephin and the Ox Mountains forming the backdrop. The Murvagh Penninsula jutting out onto Donegal Bay is the home to one of Ireland's outstanding Championship links golf courses. The course measures a mighty 7,200 yards from the back. It was designed by the legendary course architect, Eddie Hackett, in 1973 and further enhanced in recent years by Pat Ruddy. 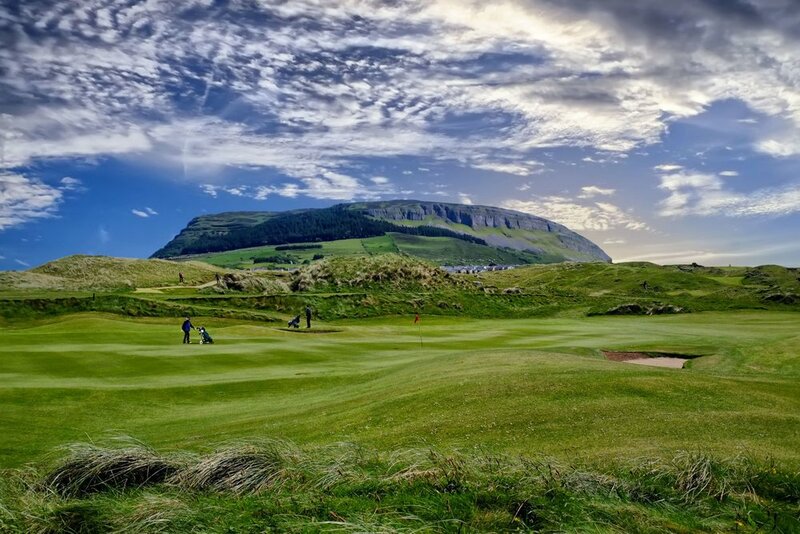 Strandhill Hill Golf Club is a beautiful 18 hole links golf course situated on Ireland's Atlantic coast in Strandhill, The course boasts stunning views of the surrounding Atlantic ocean with Knocknarea mountain providing the back drop. Carne Links lies in magnificent unspoiled sand dunes overlooking Blacksod Bay and the wild Atlantic Ocean. It was the last links course to be designed by the late Eddie Hackett and it is now believed by many who have played it to his greatest challenge.